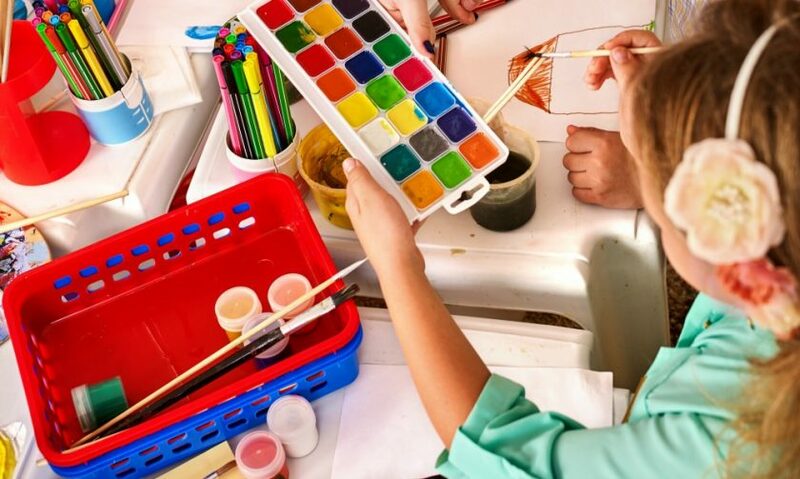 Inside: Is kids’ art clutter driving you crazy? 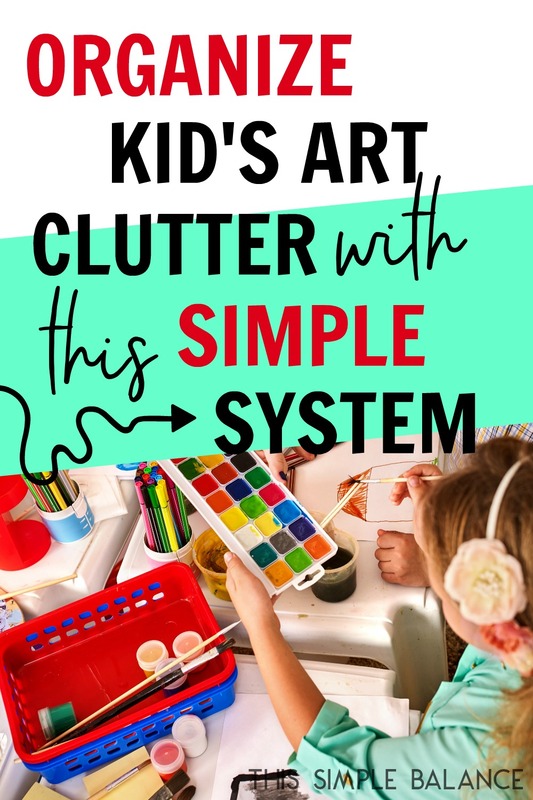 Implement this super simple system for dealing with kids’ artwork to eliminate decision fatigue and keep your home clutter-free. I’m a big fan of simple storage solutions designed to work with your family’s habits, not against them. 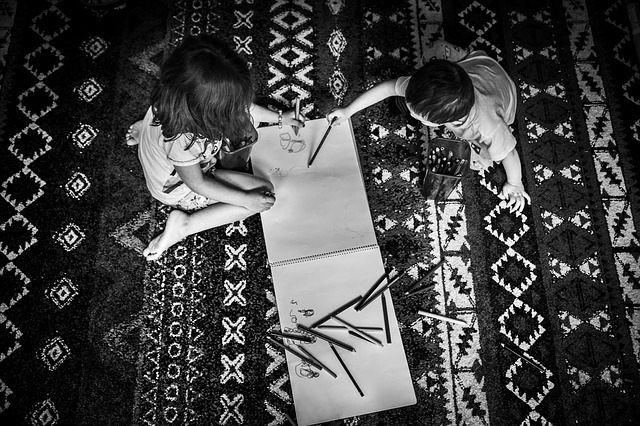 Today, I’m sharing my super simple method for figuring out how to store your kid’s artwork. If there’s anything that can bring on decision fatigue, it’s deciding what to do with ALL THE PAPER. Seriously, how can one child (let alone two more) produce so much art?! And when I say art, I’m referring of course to the hundreds of indecipherable drawings just one of my kids can produce in a week. My kids love to draw, and I keep white paper, markers, and crayons easily accessible at all times on the kitchen table. Because I get most of our paper for pennies at Staples every quarter, I rarely regulate the amount of paper they use in a day. The result? The entire kitchen table is covered in art in a matter of minutes. When a creative streak hits them, those kids can amass a stack of drawings faster than I thought possible. It’s impressive really. Now, some moms have no trouble taking that entire, massive stack of papers and dropping them straight into the recycling bin. Moving on. Done. Good-bye. Not a trace of guilt. But the particular combination of personalities in our house makes dealing with kid’s artwork extremely difficult and time-consuming. First, my oldest child is extremely sentimental, which makes having a minimalist parent a real challenge, I’m sure. Second, I am decidedly NOT sentimental, but I am (to my dismay) a high “F” on the Myers’ Briggs personality scale. So I have strong minimalist tendencies, and I feel other people’s feelings especially strongly. When my daughter’s desire to keep things and my desire to purge things collide, the discord makes me cringe. So when my sentimental child innocently left the table every day and asked if I’d keep everything on it, I wracked my brain for a way to word my answer just so in order to make me putting it all in the recycling bin completely o.k. Even when I managed to come up with proper wording, I still felt guilty. I truly did want to preserve the memories of this early art, but I simply did not have the brain space to pick and choose. How to decide what artwork to keep and what to throw away? Making that decision daily amidst the craziness that is life with four kids just didn’t make sense. How could I possibly know which drawings were masterpieces – their best work – when all I had to compare them to was the same day’s drawings? Even if I managed to choose the best few, it still was time-consuming to look through them all and decide. Put everything in one bin until you have a chunk of time to sort through it and decide what to keep. We have a bin that is close to our kitchen table where all your kid’s artwork goes. Every day, I pick up all the paper and drop it into the bin. It takes less than a minute, and I don’t need to think about it. Every couple months or when the bin is full, I set aside a chunk of time to sort through them altogether. Once I have what I want to keep, I label them with the child’s name and approximate date. Then I place them in their assigned folder. Occasionally, a drawing really stands out to me. When it does, I tape it up on the side of our fridge with washi tape. No fancy DIY frames here. We use this one because we love IKEA Kallax shelves and have four of them in our home. Any basket or bin will do, though. You can usually find them at thrift stores and yard sales for a few dollars. 2) Put it close to where your children usually draw. Why add time to the project by needing to get the basket down or walk to another room? It sounds like a no brainer, but I used to have our bin in another room. Once I realized my mistake, I quickly relocated it close by the kitchen table. I pick up the papers and dump them in. Easy peasy. 3) If your children are close in age or drawing ability, ask them to label their artwork with their name if they want you to keep it. That small chunk of time could become a much bigger chunk if you need to decipher whose picture is whose. You think you’ll remember? Well, I thought I’d remember my child’s first word, too. And that’s now gone forever. Soooo…if you want to remember whose it is, write it down! 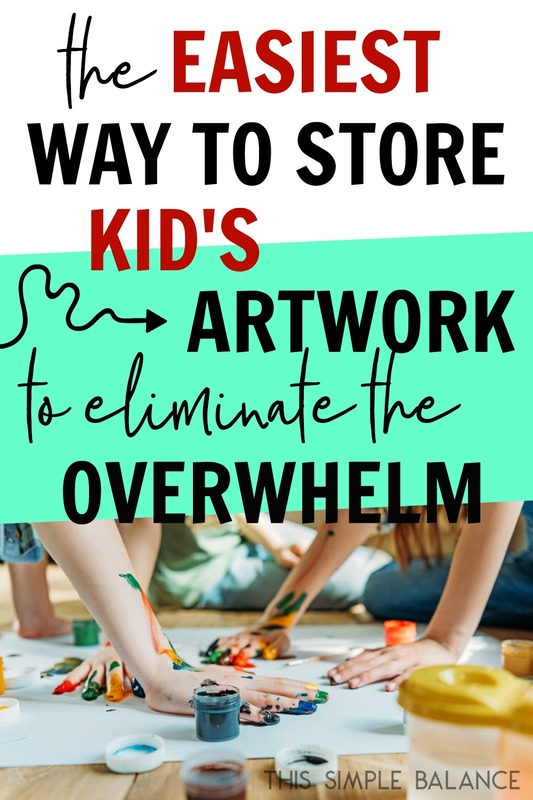 4) Choose a method to store kid’s artwork you want to keep. 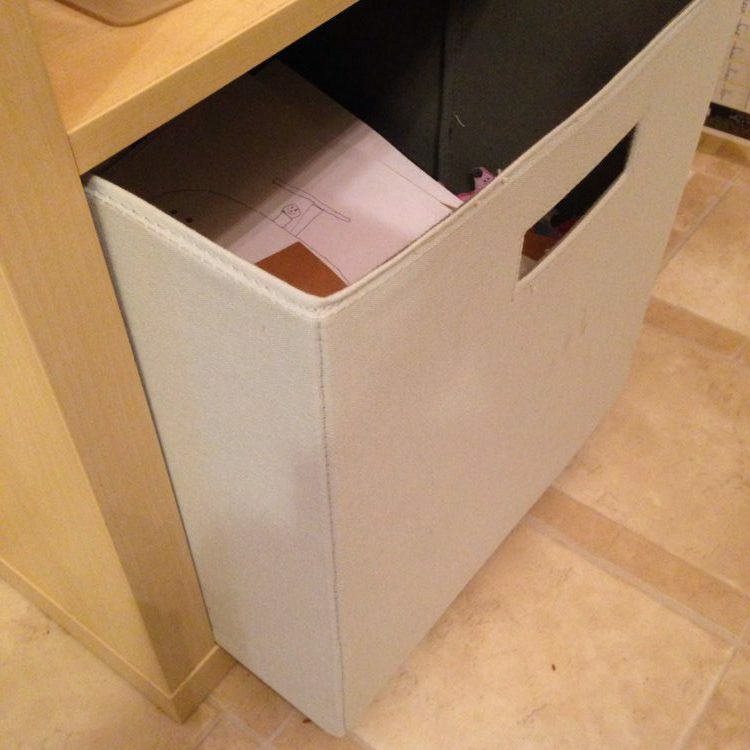 Pick a binder, a bin, or a storage box. I love these storage boxes personally, one for each child. It doesn’t really matter as long as it makes your life easy. If you get bogged down in trying to narrow down the selection, don’t. You can always look at a whole year’s worth of your kid’s artwork later on and pare it down again, keeping only the very best from the year. The longer the time span you can look at all at once, the easier it will be to see what you want to keep that captures the best of each age and shows their skill development over time. Go with your gut, and keep what seems like it will be meaningful and memorable. If one of them grows up to become an artist, they’ll be thankful one day that you kept it. This idea has been working so well for me – thanks! It’s so much easier to judge if I want to keep something even a month later. June, I’d love to hear what you do about coloring books, workbooks, and other things that get used halfway and forgotten about 🙂 We don’t buy coloring books, but the grandparents do, and they inevitably get “stale” after a week or two. How do you get your paper for pennies? Staples offers “penny paper” three or four times a year. You can purchase up to four reams at a sale price (usually 5.99 a ream or so of 500 pages each). You do one of their online easy rebates forms, and they send you a Visa card with 5.98 back per ream. I just got mine in the mail yesterday.